A New Mac Tip Every Day: Wikipedia in the dictionary in many languages! 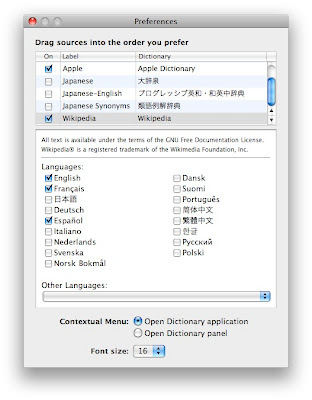 When you open the built-in Dictionary in Leopard, you will notice that you can now access Wikipedia right there in the Dictionary application. That is a great feature, but by default, you get Wikipedia in the language of your OS. It is however possible to change it to another language or even to add other languages. 1. First, go to Dictionary, Preferences. 2. Scroll down to Wikipedia and click on it. 3. Select the languages you want. You can find many more in "Other Languages". With all the possibilities of changing Wikipedia to suit the whims of just about anybody, I have serious doubts about the authenticity of many of the entries. There are much better, and much more accurate, sources for dictionary information than Wikipedia. No offence Waldamar, but the accuracy of Wikipedia has been debated to death. We all know it is possible to change it. This is both its greatest strength and weakness. Any idot can change it to crap, and any other user can change it back. 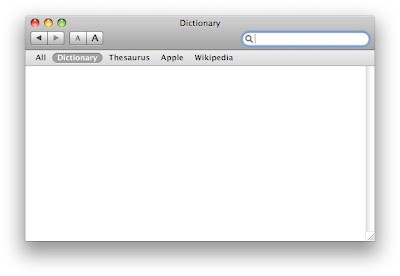 But you are correct, there are more accurate sources of information, such as the real dictionary built into Mac OS X.
I don't yet have Leopard, but I love your tips. Could you please mark your tips that are only useful in Leopard. Thanks again. Very useful tips! Especially the shortcuts. Tnx Dr. Alf for the confirmation of my comments. And while I don't want to "beat a dead horse", I really don't think that altering facts, posting inaccuracies and in some cases downright lies can be construed to be a "strength" of information meant to be accurate. I sometimes think Wikipedia is more "opinion" than fact. It just seemed to me that, as you so rightly point out, the Mac OS X is by the very nature of what it is the first line of accuracy. Is there a way to incorporate Wikipedia into the Mac widget? I only have Dictionary, Thesarus, and apple... I know there's a separate widget but hey, who wants to add another widget if they don't have to? Great idea for a blog! It's great to see a new tip everyday. Keep it up!